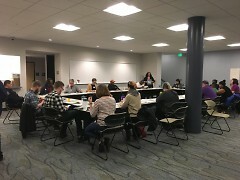 A five part workshop series aims to increase resident connections in the Heartside Neighborhood. 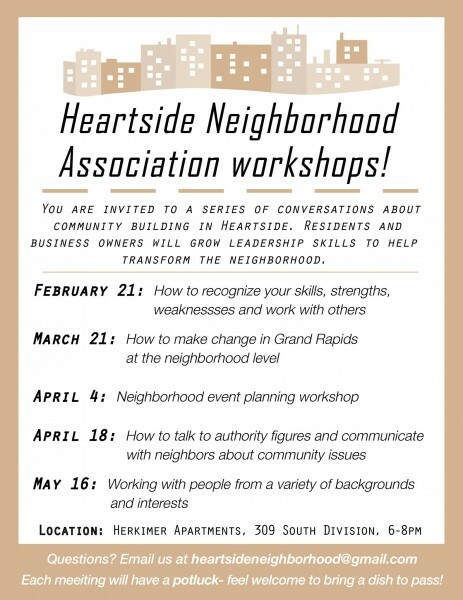 Join the Neighborhood Association for the following workshop series! Located in the Herkimer Community Room, 309 South Division from 6-8PM. Subscribe to the Heartside Neighborhood Association Facebook group to stay in the loop of events and happenings within the Heartside community. 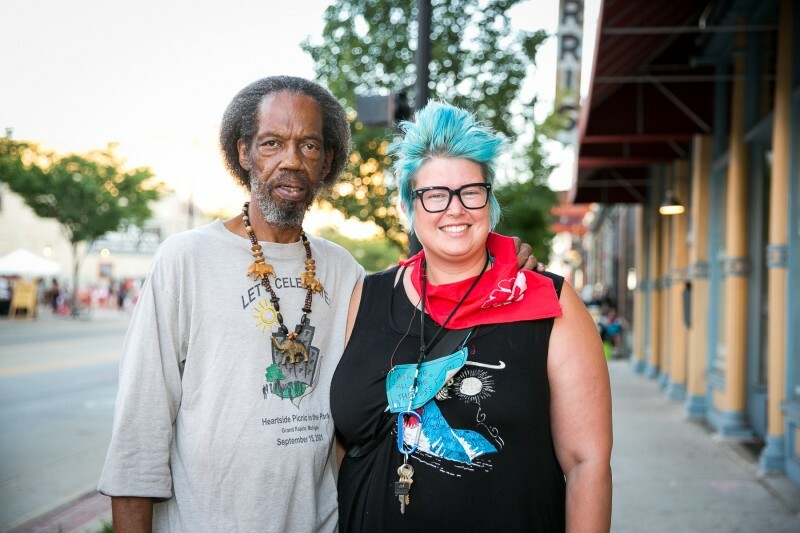 “What keeps me focused is that I really want to see Heartside expand and grow, and I want to be a part of that change that takes place” says Heartside resident, Marvin Thomas. 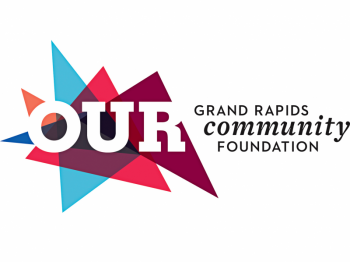 Located in downtown Grand Rapids, Heartside stretches from Wealthy to Fulton streets, and from Lafayette Street to the Grand River and includes a diverse mix of residents, business owners, nonprofits and visitors. From getting involved with community gardening clubs, Avenue for the Arts, Heartside Ministries and Studios, Heartside Neighborhood Association meetings, Heartside Business Association meetings and resident meetings in individual buildings, residents and neighbors are making positive change in Heartside. One resident, Matthew Childs, who has been actively involved in Heartside says he has greatly benefited from getting involved. “I experienced growth and change with these meetings." Childs regularly attends the Heartside Neighborhood Association meetings and knows almost every business owner along South Division Avenue. “One of the things gained was insight and friendships," says Childs. He didn't always live in the Heartside neighborhood, but since moving here over two years ago, Childs decided to become familiar with his new neighborhood and neighbors, something that is very important to him. 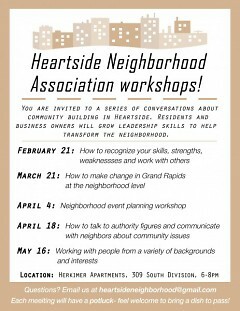 The newly forming Heartside Neighborhood Association (HNA) is made up of residents and business owners in the Heartside Neighborhood. The HNA is just starting back up after a four-year hiatus and right now a main focus of the resident-lead group is increasing civic engagement and leadership in the neighborhood. A new workshop series was created by a group of residents from Dwelling Place who attended the NeighborWorks Community Leadership Institute (CLI) in October 2016. The workshop has an emphasis on building leadership skills and is hosted during HNA meetings. HNA participants hope that the current workshop series will give residents the tools to feel empowered and to find their own place and voice within their community. “The positiveness that (the first workshop) did bring about was us working together to get answers on different subjects”, says Heartside resident Silas Deans, who attended and helped to organize the February workshop, How to Recognize Your Skills, Strengths, Weaknesses and Work with Others. Having lived in the Neighborhood for 25 years, Deans was the former NHA president, and participates in many Heartside program and leadership groups, including CLI. “It has taught me a lot, I’ve really had the opportunity to gain some leadership skills and knowledge," says Heartside resident Marvin Thomas. His involvement with the Heartside Neighborhood has taught him “to be compassionate, humble, and to be aware.” Both Thomas and Deans attended the NeighborWorks Community Leadership Institute (CLI) this past October with the team of residents from Dwelling Place. Armed with the goal to increase participation in the HNA the group was determined to come up with a way to foster resident leadership. Since the CLI training they have continued to meet twice a month, planning the workshop series. “We are all uniquely different, we all think different, we feel different, it was just a lot of different things that came out of that workshop that was fun and engaging”, Thomas says about the February workshop series. The Neighborhood Association along with the many other programs available in the Heartside community, act as great outlets to allow for a collaborative process while also teaching valuable skills that can carry through to many aspects of one’s life. “I just want to see Heartside become more vibrant, more leadership enthused residents who are excited about seeing Heartside make positive changes” says Thomas, and by using the resources available and by coming together as a collective community, a more civically engaged and leadership-oriented neighborhood is possible. The Avenue for the Arts is a neighborhood title for the South Division commercial corridor. We are residential, commercial and nonprofit groups working together in a creative community. We are residents in Heartside, and active participants in shaping change in our neighborhood. In 2005, we choose the Avenue for the Arts as a title to represent our commercial corridor and the projects and events that we create. Because the Avenue is powered by volunteers guest writers create our Rapidian content. Special thanks to Ashley Acton, Avenue member and Grand Valley State University Visual Studies student for contributing this piece.